A pair of halal slaughtermen who inflicted “extreme” suffering on sheep have escaped jail, with a further two suspected of similar crimes escaping justice by fleeing the country. The two men, who worked at an abattoir producing meat in accordance with Muslim sharia law in Northern England, were handed suspended jail terms, despite being filmed dancing and singing as they killed animals, a court heard. A total of four people were convicted in connection with crimes committed at the Bowood Abattoir, at Busby Stoop, near Thirsk, at Leeds Magistrates Court on Friday, the Northern Echo reports. Two of them – Kabeer Hussain, 44, and Kazam Hussein, 55, both of Bradford – were seen taunting animals, waving knives in front of them, and shouting at them in footage captured by Animal Aid. 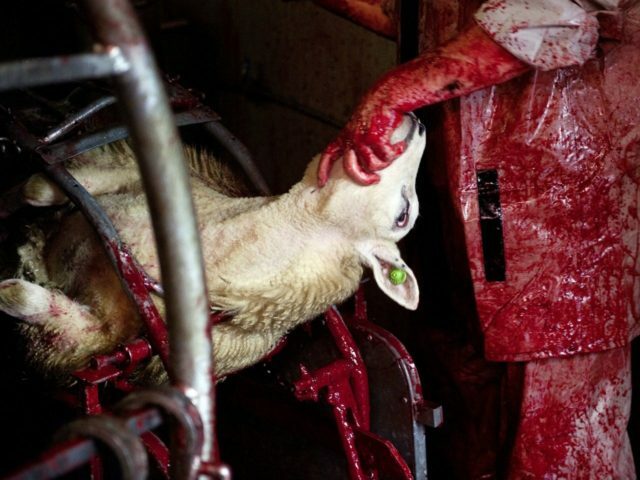 The footage, filmed in 2014, shocked the nation when it was obtained by the press in 2015, sparking a debate about the ethics of halal slaughter and legal exceptions which allow for animals to be killed un-stunned in the European Union (EU) for religious reasons. Howard Shaw, prosecuting for the Crown Prosecution Service on behalf of the Department for Environment, Food and Rural Affairs (Defra), told the court the footage revealed “a large number of sheep were caused to suffer unnecessarily”. Both men were professionally qualified and licensed and killed the sheep in line with halal regulations when operations were overseen by the on-site vet. Also shown in the footage was 33-year-old conveyor belt operator Artur Lewandowski, of Darlington, picking a sheep up at the neck and raising his fist as if to punch the animal, shortly before it was sent to its death. Mr. Lewandowski was given a community order to complete 150 hours of unpaid work, and pay costs of £160. Kazam Hussein and Kabeer Hussain were given 18 and 16-week suspended prison sentences respectively and ordered to pay £580 in costs each. Former director of the business William Woodward, 32, of Northamptonshire, pleaded guilty to failing to prevent unnecessary suffering of animals. He was ordered to pay £5,080 towards the prosecution and received a 20 week suspended sentence. Speaking after the hearing, Animal Aid campaign manager, Tor Bailey added: “We greet these sentences with huge disappointment since we do not feel that they reflect the severity of the abuses uncovered by our investigation.